McCormack Innovation, which is leading the advancement in soluble healthcare products, is in talks with the largest cosmetic company in the world. Brian McCormack, a former miner turned inventor, was approached by scouts from this cosmetic company, who were interested in his soluble wet wipes. They are trialling the wipes, as are the world’s largest distributer of stoma care products. Adhesive remover wipes play an important part in the changing of stoma bags. Four and a half thousand soluble wet wipes have been manufactured and distributed for trial purposes, having been licensed for European production and distribution with wipes manufacturer, Guardpack. The environmental benefits that these soluble wet wipes can bring is without question revolutionary. McCormack Innovation is well ahead of competitors, with its wet wipes close to passing the Water Research Centre’s Fine to Flush test. Wet wipes are only one of McCormack Innovation’s range of soluble healthcare products. Under the branding of ‘FlushAway’, the soluble products have the potential to revolutionise the healthcare sector. 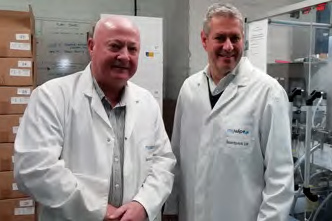 McCormack Innovation’s flushable bowel cancer screening tool is generating sales around the world. Gut Feeling in Sweden has just ordered 3,000 FlushAway products, whilst the South Alabama University Hospital is keen to take the stool collection product to the US market. Brian added: “I developed these soluble products after seeking a more convenient way of collecting samples for bowel cancer screening after being tested myself. I undertook a long period of research before finding a US firm that could develop an effective level of solubility that is safe to use in a healthcare setting, whilst being environmentally friendly.